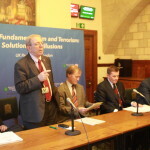 On Wednesday, February 25, cross party MPs and Iran experts discussed the roots and solutions to the new global threat Islamic fundamentalism and terrorism in a joint conference by the British Parliamentary Committee for Iran Freedom (BPCIF) and International Committee In Search of Justice (ISJ) in the House of Commons, chaired by the Rt Hon. 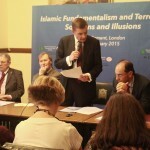 David Jones MP, former Secretary of State For Wales. 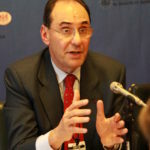 The conference’s keynote speaker, Prof. Alejo Vidal-Quadras, President of the International Committee in Search of Justice (ISJ) and the Vice President of the European Parliament (1999-2014) presented ISJ’s new report “Islamic Fundamentalism and Terrorism: Solutions & Illusions”. 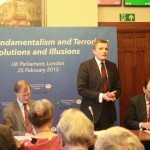 The report is a comprehensive study of Iran’s export of Islamic fundamentalism and terrorism with the aim of offering a new different approach to counter this new global threat. The former Vice President of the European Parliament added that, “A real solution to this threat cannot remain limited a military-intelligence campaign, it will truly lead to no results. Also, efforts to find moderates inside the Iranian regime, attempts to convince Tehran to end its support for terrorism and provoking fundamentalism and extremism through negotiations or providing incentives have been one of the nearly permanent aspects of US policies. But theses efforts have failed and to some extend have had catastrophic consequences for the region as seen today”. 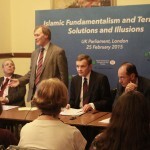 Others attending the conference were: Sir David Amess MP, Co-chair of the the British Parliamentary Committee for Iran Freedom (BPCIF); Sir Alan Meale MP; Dr Matthew Offord MP; Jim Shannon MP; David Crausby MP; Mike Freer MP; The Rt Hon. 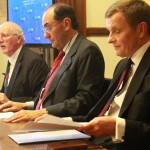 Lord Maclennan of Rogart; Lord Cotter; and Peter Carter QC, former Chair of the BHRC of England and Wales. Peter Carter QC, former Chair of the BHRC of England and Wales, spoke about a recent initiative by the BHRC president, Kirsty Brimelow QC, to write an open letter to the UN Secretary-General Ban Ki-Moon, to call for urgent measures by the UN to secure the safety and well-being of the Iranian refugee in Camp Liberty.